Director – George Sherman, Screenplay – Frederick Kohner & Dane Lussier, Based on the Novel Donovan’s Brain by Curt Siodmak, Photography (b&w) – John Alton, Music – Walter Scharf, Special Effects – Theodore Lydecker, Art Direction – Russell Kimball. Production Company – Republic Pictures. Professor Franz Mueller has a laboratory in Phoenix, Arizona that he names The Castle. Aided by local doctor Patrick Cory and nurse Janice Farrell, Mueller is engaged in an experiment to remove the brains of monkeys and try and keep them alive in a tank. When a small plane crashes outside of town, Cory is rushed to the scene and brings the survivor back to The Castle. As the man is pronounced dead, Mueller makes the decision to remove his brain and place it inside the tank where they are successful in keeping it alive. They realise afterwards that the brain is that of millionaire William H. Donovan. Mueller starts to feed the brain more energy food in the hope of getting it to communicate. Instead the brain sends out telepathic messages to Cory and then takes over his personality. Under Donovan’s influence, Cory travels to Los Angeles where he accesses Donovan’s secret accounts and then sets out to make every effort to free from jail a man guilty of murder. Curt Siodmak (1902-2000) had a long film career as director, novelist and screenwriter. Born in Poland of an Orthodox Jewish family, Siodmak relocated to Germany where he wrote a number of science-fiction films and novels. Following the rise of the Nazis, he fled to the USA and found his true calling as a screenwriter in Hollywood where he turned out a host of B movies, including several among Universal’s Frankenstein, Invisible Man and Dracula sequels of the 1940s. His most famous work was the screenplay for The Wolf Man (1941), which created the essential mythology of the werewolf film. (See below for Curt Siodmak’s other works). One of Curt Siodmak’s most enduring works has been the novel Donovan’s Brain (1943). It is a readable enough book but fairly unremarkable on its own terms. The great surprise that it has led to no less than three different film adaptations within a twenty-year period. The first of these was The Lady and the Monster here. It was followed nine years later by Donovan’s Brain (1953), the most well-known version, with Lew Ayres as the scientist and no less than later-to-be First Lady Nancy Davis Reagan as the lead actress. Nine years later, there was a West German-made version Vengeance/The Brain (1962), one of the first films from Anglo-horror regular Freddie Francis, although this widely varied from the book. The Lady and the Monster also makes some substantial changes to the book. The most obvious of these begins with the title The Lady and the Monster – it should be noted that neither features in the book – there, for instance, the only person that fits the description of lady is Cory’s wife. The film toplines Vera Hruba Ralston in the ‘lady’ part – although she gets top-billing, hers is only very much the supporting part of a laboratory assistant and notedly has no equivalent in the book. (Ralston was a Czech-born ice-skating champion who relocated in the US and married Hebert Yates, the head of Republic Studios. He frequently tried to promote her as a leading actress despite her widely lauded lack of talent that even had her nominated in The Golden Turkey Awards (1980) as The Worst Actress of All Time). The other obvious aspect is that neither the book nor the film features any monster. You are not entirely sure if the title is being made to refer to either Erich von Stroheim’s scientist or the brain in the jar; certainly, nothing in terms of what you expect of a monster movie of this era such as rampaging apes or reanimated dead. The other noticeable thing about the story is that it has been bent out of shape to include the character of the scientist played by Erich von Stroheim. (Von Stroheim was an Austrian immigrant to the US who had a career as an actor with roles in classic films such as Le Grande Illusion (1937) and Sunset Blvd. (1950). Most celebrated though has been von Stroheim’s work as a director with films such as Greed (1924), one of the most acclaimed of all silent films, and The Great Gabbo (1929), the very first horror film about a ventriloquist’s dummy). No equivalent of von Stroheim’s Mueller appears in the book – there Cory is the protagonist, the one who retrieves Donovan from the crash and removes the brain only to come under its influence. Here for the first half of the film, Cory is essentially a supporting character who is only assisting von Stroheim. 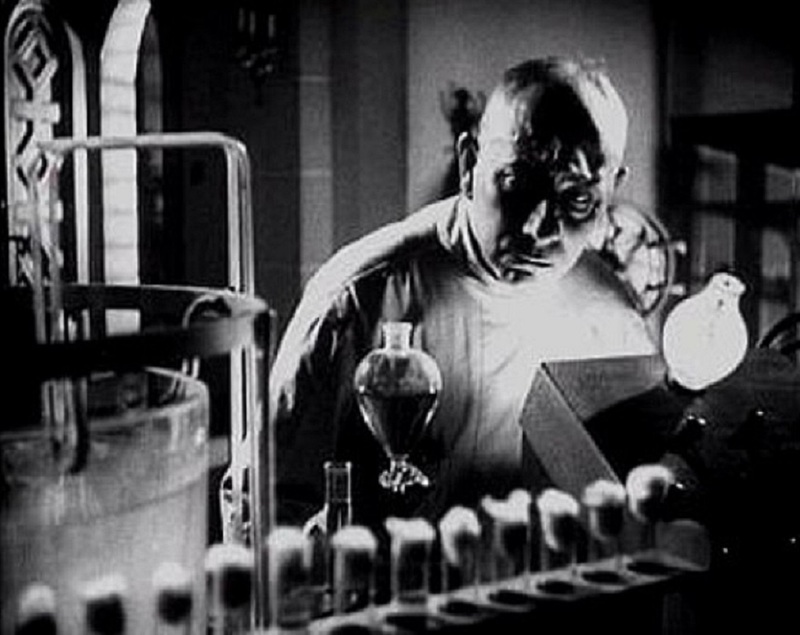 The reason for the addition of von Stroheim’s scientist would seem to be that the studio has distorted Donovan’s Brain to try and make it into a mad scientist film, which was one of the most prominent forms of horror output throughout the 1930s and 40s and of which Republic was producing a great many cheap examples. 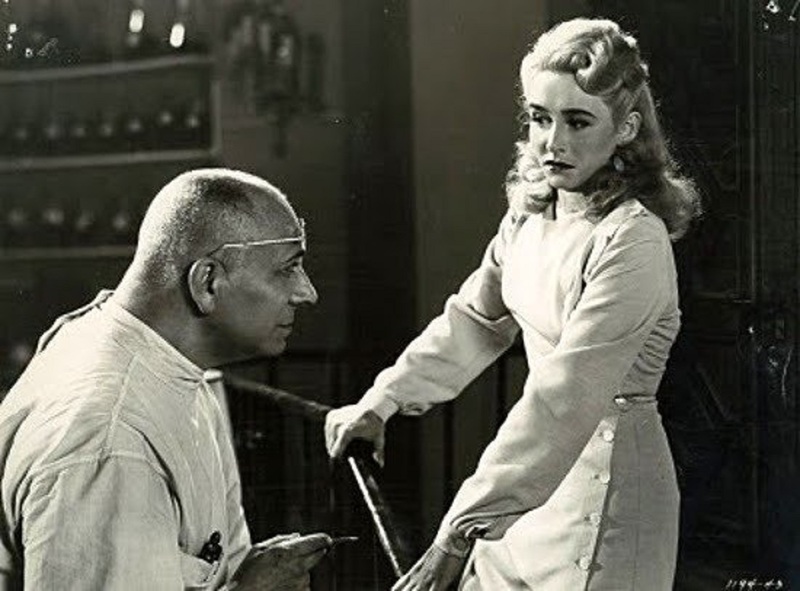 Von Stroheim has essentially been cast in a Bela Lugosi role – present to leer with accented foreign menace, bald head and gleams of intent in the direction of Vera Hruba Ralston. The film is supposedly set in Phoenix, Arizona where von Stroheim has been rather absurdly outfitted with a large old mansion that everyone refers to as The Castle and a severe-looking maid – Hitchcock’s Rebecca (1940) had just been a huge success – in a determination to take the film into Gothic territory. Republic made a great many of these mad scientist films during this decade, mostly featuring Bela Lugosi or George Zucco. Among these, The Lady and the Monster feels like a prestige production and is certainly better budgeted than most of the others films that Republic put out. Eventually it gets a good deal of atmosphere out of the brain sitting in the tank glowing ominously. Especially good is the scene where Richard Arlen sits down to write and then without noticing switches hands and signs Donovan’s signature. After this point, von Stroheim’s scientist drops to the sidelines and the film remains surprisingly faithful to the book as we watch Cory being dominated by the brain and engaged in Donovan’s dealings. The main problem that these scenes give the film is that we go from the fervid mad science scenes with the brain in the jar to merely a series of mundane schemings that could take place in an ordinary crime thriller. Nevertheless, George Sherman gives them much effect, particularly in the way the brain’s control is denoted by a series of closeups on Richard Arlen lit from beneath. Curt Siodmak’s other genre scripts include:- F.P.1 Does Not Answer (1932), Trans-Atlantic Tunnel (1935), The Ape (1940), Black Friday (1940), The Invisible Man Returns (1940), The Invisible Woman (1940), The Wolf Man (1941), Invisible Agent (1942), Frankenstein Meets the Wolf Man (1943), I Walked with a Zombie (1943), Son of Dracula (1943), The Climax (1944), House of Frankenstein (1944), The Beast with Five Fingers (1946), Tarzan’s Magic Fountain (1949), Riders to the Stars (1954), Creature with the Atom Brain (1955) and Earth Vs the Flying Saucers (1956). Siodmak also directed/wrote several films with Bride of the Gorilla (1951), The Magnetic Monster (1953), Curucu, Beast of the Amazon (1956) and Love Slaves of the Amazon (1957). Siodmak’s lesser known novel Hauser’s Memory (1968) about transplanted memories was also filmed as the tv movie Hauser’s Memory (1970). Director George Sherman had made nearly a hundred Westerns between the late 1930s and the 1970s. His only other genre film was the Arabian Nights farce The Wizard of Baghdad (1964).